Five workers have died after a wall collapsed on top of them at a recycling centre in Nechells in Birmingham. 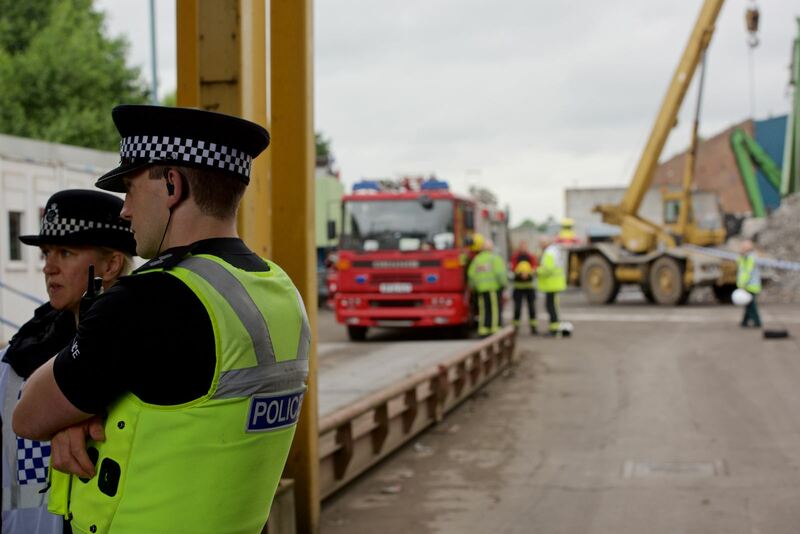 All five bodies have now been recovered from the scene of a wall collapse at a recycling plant in Nechells in Birmingham. The men had been trapped under tonnes of fallen concrete and scrap metal. Ben Brook from West Midlands Fire Service has given a final update from fire crews as they prepare to leave the scene. 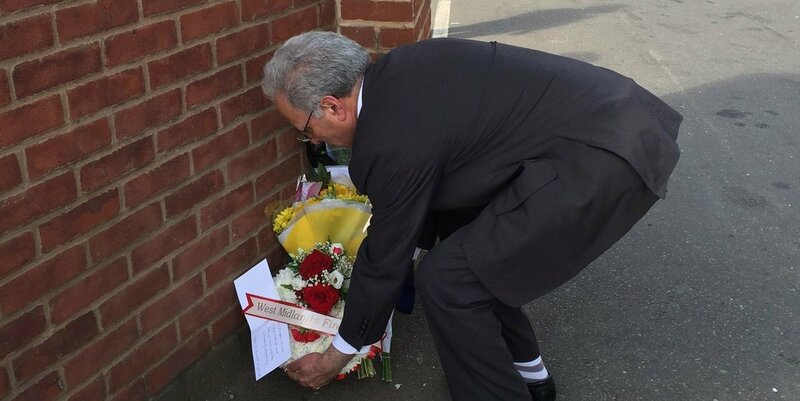 Councillor Idrees, the Deputy Chair of the Fire Authority, lays wreathe to pay respects on behalf of brigade at the site of the deaths. Detective Superintendent Mark Payne from West Midlands Police was at the scene all day yesterday and is back there today and has praised the Gambian community for their help in identifying relatives of the victims. This lunchtime, West Midlands Fire Service gave Heart an update on the recovery work - at that point three bodies had been recovered. It happened at Hawkswood Metal Recycling in Aston Church Road in the Nechells area of Birmingham at about 8.30am this morning, Thursday. Two ambulances, a paramedic area support officer, the Midlands Air Ambulance from Cosford with the MERIT Trauma Doctor on board, the Hazardous Area Response Team, a senior paramedic officer and an emergency planning officer were sent to the scene. A West Midlands Ambulance Service spokesman said: “On arrival, ambulance crews found a wall that had collapsed. Sadly, there was nothing that could be done to save the five men who had been working next to it. An investigation into what happened is now underway. The Health and Safety Executive (HSE) has been notified and are assisting officers at the scene. Detective Superintendent Mark Payne, from Force CID, said: “We are still in the very early stages of this investigation to determine exactly what happened this morning. “Sadly five people have lost their lives and we have several teams of specialist officers supporting their families at this time. Assistant Chief Fire Officer Gary Taylor said: "This is a devastating incident for everyone involved. Our thoughts and deepest sympathies are with the victims' families and colleagues. "We have an assertive recovery plan in place and expect this operation to take several hours,'' he said. Shabana Mahmood is the MP for Ladywood the constituency where the recycling plant is located. She's told Heart the family will want answers. The recycling firm was fined #50,000 four years ago after a worker's arm became trapped in machinery. Hawkeswood Metal Recycling Ltd was also ordered to pay more than #10,000 in costs in July 2012 after pleading guilty to a breach of health and safety law. The financial penalties, imposed at Birmingham Crown Court, related to an incident which happened in April 2010. The court was told that the worker was injured after attempting to remove a piece of scrap metal from a machine which should have been covered by a protective guard. A defence lawyer told an earlier hearing that substantial health and safety training had been given to the worker before the incident. The company said it had also replaced all its machinery with newer and safer technology and had gone "above and beyond'' the recommendations of the HSE following the accident.